Trax offers an Impressive EPA-estimated 34 MPG highway and 26 MPG city. Standard Variable Valve Timing helps to improve fuel economy. 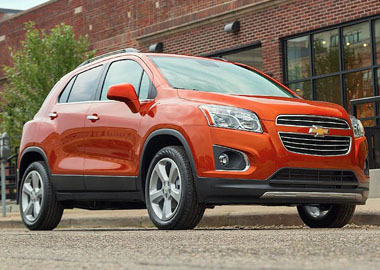 Trax features eye-catching wheel flares and a signature Chevrolet dual-port grill that are sure to get looks. 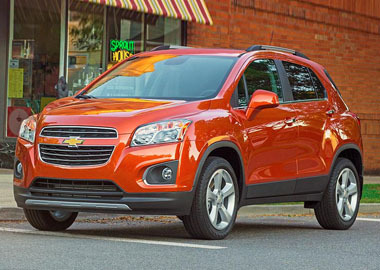 A dual-port grille, swept-back headlamps and available chrome accents give Trax major curb appeal. With a variety of seating configurations to fit passengers and cargo, Trax is the small SUV that’s big on versatility. 60/40 split-folding rear seats give you the flexibility to carry a bike, paddleboard, vintage dresser or whatever life brings. And a fold-flat front passenger seat allows you to carry items up to eight feet long. Take on any adventure in the new 2016 Midnight Edition Trax, arriving early 2016. With its alluring, black aesthetics, Midnight makes your daytime and after-dark excursions that much more exciting. The 2016 Trax offers advanced safety features to help prevent and protect you from a potential collision, and available OnStar technology to respond in the event of one. 6 months of the OnStar® Guidance Plan on most Chevrolet models.